Chart: What's In Your Fruits And Veggies? Your mother was right when she told you to eat your vegetables, but maybe not for the reasons you think. New research suggests it may not be the vitamins and nutrients in fruits and vegetables that are so good for you – it may be their toxins. Plants naturally produce chemicals to ward off insects and other would–be predators. When we eat fruits and vegetables,these chemicals stimulate our nerve cells and seem to boost our body’s resistance to disease. We hear more about the benefits of toxins in fruits and vegetables, and other anti-aging research. The Physicians Committee for Responsible Medicine uses this chart to help patients navigate food and its benefits. MS. DIANE REHMThanks for joining us. I'm Diane Rehm. 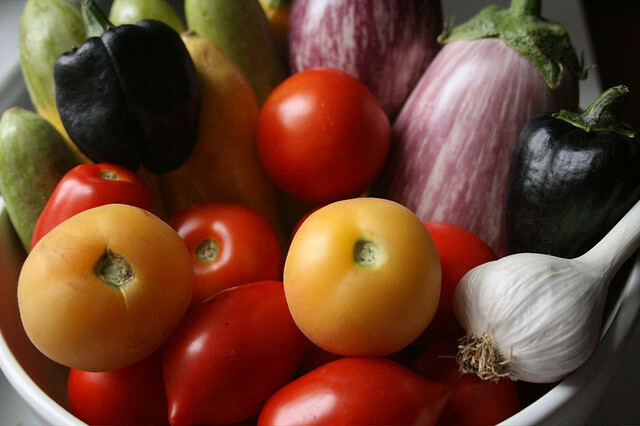 We all know vegetables are good for us, but now we may know more specifically why. New research indicates that naturally occurring toxins in fruits and vegetables help us ward off disease. Joining me to talk about new research on what can help us live longer and healthier lives, Doctors Toren Finkel and Mark Mattson of the National Institutes of Health. MS. DIANE REHMAnd by phone from Boston, Leonard Guarente of MIT. I hope you'll join us, 800-433-8850. Send us an email to drshow@wamu.org. Follow us on Facebook or Twitter. And thank you all for being with us. DR. MARK MATTSONNice to be here. DR. TOREN FINKELPleasure to be here. REHMThank you. Dr. Mattson, I am absolutely fascinated with this subject, I want you to know. And you're a neuroscientist who studies what can go wrong with the brain. So explain how your research lead to vegetables. REHMAll right. First, you've got to explain free radicals. MATTSONYes. So free radicals are produced when we burn oxygen to generate energy for our cells. And normally, cells can get rid of those free radicals so that they don't damage molecules in the cells. MATTSONAnd so then, our work that we and others did showed that you can't just swamp cells with antioxidants and protect them because what happens is the cells actually reduce their ability to cope with more severe stress. So now, what we're thinking is, and there's evidence for, is that many of the chemicals in fruits and vegetables that are good for health may be good for health because they actually impose a mild stress on ourselves. MATTSONAnd from an evolutionary perspective, that makes sense because as you know, fruits and vegetables have many different chemicals and some of them, their function is to keep insects and other organisms from eating the plants. So the way they do that is by causing mild stress. For example, most of these chemicals that we think are good for health have a bitter taste. And actually, they're kind of distasteful in a way. MATTSONBut since we evolved eating all these plants, it wasn't to our advantage to be able to eat them and be able to tolerate the chemicals. And it turns out, the chemicals, as we'll hear from our other guests today, activate signaling pathways in cells that bolster the resistance of the cells to stress and maybe can protect against disease. REHMDr. Finkel, what do we mean by stress in the cell? FINKELYes. So most of the time, when you think of stress, you think about maybe paying the mortgage or picking up the kids from soccer. That's not the kind of stress that we're talking about. I think the better analogy might be, let's say, a complicated machine like your car. So when your car is low on gas, there's a light that gets indicated on the dashboard. When the tires low, similarly, or the engine pressure's low. FINKELSo it's a complicated machinery that has all these sort of sensors that tell the car that something's out of whack when it is. You cells also are very complicated machinery. It also has a variety of sensors that are activated when something's out of whack. And so the things that it cares about are things like if energy levels drop in the cell, a sensor will go off. The cells makes proteins and has sort of machinery to do that. FINKELAnd anywhere along that machine line, if something gets screwed up in making proteins, it -- the cell gets activated and a sensor goes off that says, we have a problem here. So the difference between your car and your cell is they both send stress, types of stress and they, in a sense, activate these pathways. You car, when it has problems, you take it to the mechanic. FINKELYour cell doesn't have a mechanic to go to. It's got to fix it itself. So what it does when those sensors go off, that energy is low or the protein machinery is impaired, it activates other things in the cell to try to correct the problem. So the activation of those sensors triggers a response. So, for instance, when energy is low, that sensor goes off and the cells, wait, let's stop the things that require energy. FINKELLet's turn those down and let's activate things that bring more energy into the cell. Or if the protein machinery gets screwed up, let's slow the rate that we make new proteins and maybe let's get rid of the proteins that got mismade in the process. So it has these corrective properties that result from activating these pathways. And what the research of Dr. Mattson and I and Dr. Guarente is showing is that -- and our colleagues is that mild stress sends off -- sets off these sensors. FINKELThose sensors then set off these reparative processes to try to correct the stress. But those pathways that are activated are long-lived. They last past that initial stress and they stay around and they leave the cell and the tissues and the organ and the person in a sort of heightened sense of defenses and stress resistance. REHMSo Dr. Guarente, how do fruits and vegetables fit in here? What are the toxins that actually respond to the cells that are under stress? GUARENTEWell, I would view fruits and vegetables and food in general in two ways. First is if they contain these stressors, as Dr. Mattson and Dr. Finkel discussed, and the other is if they're a part of our diet, which is the source of energy and, you know, energy becoming limiting is another stress that I think is critical and it's the kind of stress that we, in our own work, we've kind of backed into. GUARENTEAnd it's been known for about 80 years that when food is administered in a limiting fashion, but with adequate nutrition, a diet called calorie restriction, that that's extremely good for the health of animals. And the work we've been studying is to study a pathway that can sense that this calorie restriction and respond to it. And it's, again, along the lines as were discussed earlier, but I would add that in addition to revving up the ability to fight off oxygen radicals and deal with misfolded proteins, also these pathways dictate a kind of metabolic logic or strategy to cells. GUARENTEAnd the cells will say, okay, there's not a lot of energy coming in so I have to use that energy in the best possible way. And I think that that metabolism, that metabolic adaptation to the diet is equally important to dealing with stress that comes through the diet and that also includes the ability to say, okay, I'm going to make energy by a particular pathway that might generate some toxic molecules in cells so I better soup up my ability to detoxify these molecules. GUARENTESo, really, you know, just getting back to your question about fruits and vegetables, I think it's a question of toxins that might be present, but also how much food that we eat is really a critical parameter, a variable that too much food is bad. We all know that. Too little food is bad. You need adequate nutrition. But there's a sweet spot at least from animal studies and some human data that say that if we get the number of calories just right, we can really convey robust health in so doing. REHMDr. Leonard Guarente, he's professor of biology and director of the center for science and aging research at MIT. Dr. Toren Finkel is with the National Heart, Lung and Blood Institute at the National Institutes of Health and Dr. Mark Mattson is chief in the laboratory of neurosciences at the National Institute on aging, again, part of the National Institutes of Health. We are going to take your calls, 800-433-8850. REHMSend us an email to drshow@wamu.org. Dr. Mattson, Dr. Guarente was talking about that sweet spot as far as the amount of intake of food. Do we really know for human beings or does it depend on the individual what that sweet spot is? MATTSONThe answer is we don't know for sure and it probably does depend on the individual. It also, of course, depends on the amount of energy that's expended. So, for example, a marathon runner who's running 100 miles a week to train for a marathon clearly has to take in more calories than someone who is sedentary. But the interesting thing about -- we've been talking about is that chemicals, some chemicals in fruits and vegetables, calorie restriction and exercise seem to be at the level of individual cells triggering at least some of the same exact responses. MATTSONAnd there are certain what we call signaling pathways that involve chains of communication that seem to be shared among these different stimuli. REHMAll right. We'll talk more about all this fascinating stuff after a short break. Stay with us. REHMAnd we're back, talking in this hour about new research that indicates naturally occurring toxins in fruits and vegetables help us ward off disease. Can you, Dr. Mattson, explain a little more? Let's take cooked carrots or let's take fresh apples. Tell us about the toxins that are naturally grown -- naturally developed in those foods that, as we ingest them, may help us to ward off disease and may actually help to extend life. MATTSONWell, I'll start briefly with an evolutionary perspective, in that, plants, as you know, they can't run away from predators. And so instead of running away, over millions of years, they've evolved the ability to produce a myriad of chemicals -- thousands and thousands of chemicals that function to prevent insects and other organisms from eating the plant. And most of these chemicals actually don't kill the insects or the herbivore that's eating the plants, but they have a bad taste. And so it's the nervous system that first senses the presence of these potential toxins. MATTSONYeah, those nerve cells. And so, just as we may have some really bitter -- eat some bitter plant and not want to eat much, it's the same with the insects. And then, as we evolved, eating different fruits and vegetables and plants, we became able to tolerate more and more of these chemicals because it was to our advantage to be able to eat the plants to get the other nutrients -- the calories and other nutrients that we need to survive. And then, coming to your question about raw -- raw vegetable versus cooked, many of the chemicals we're talking about are very tolerant to heat and would withstand cooking. On the other hand, there seem to be some advantages in eating raw vegetables that have to do with the fact that they have bacteria on them. MATTSONAnd it turns out, for the most part, these are good bacteria from the standpoint of our gut. And there's been a lot of interest in -- even in the lay press lately -- about bacteria in the gut, and there's good and bad bacteria and probiotics, you know, eating yogurt. It turns out that there's emerging evidence that bacteria that are in fresh fruits and vegetables that would be killed by heating may actually be good for our gut and improve our health in that way. REHMDoes all that suggest that the maximum healthy diet is a vegetarian diet? MATTSONThere's good, what we epidemiological evidence, that that may be true. That is, studying populations throughout the world and looking at their diets. And there's good evidence that people who eat mostly plant-based diets are healthier -- healthier longer in their lives. And so I'd say, overall, that's true. We need to get some protein. On the other hand, probably most Americans eat way too much protein. REHMWay too much protein. And, Dr. Finkel, the idea of fasting has been mentioned, which I'd like to get you and Dr. Guarente to talk about. Is there a minimum amount of fasting that seems to help individuals? FINKELSo I think the evidence is that less is better -- so less calorie intake. People have tried it. Especially, the data in humans is less abundant because it -- I mean, there are now randomized trials of people voluntary calorie restricting. The compliance -- the initial first randomized trial asked people to have a 20 percent reduction in calories. And they were able to achieve roughly an 11 percent with, you know, people begin to be very -- in the first six months are very compliant. And then it's harder and harder for people to do. And so, but, the first trial has happened in randomized fashion. There's another trial and a larger group of people. So that data will come to see if it truly is beneficial to people. FINKEL...are all important. But I think it comes back to sort of the point that Dr. Guarente was making that either the chemicals in plants or just reducing the amount of food you take sort of stresses the body and makes the body choose what to do with the limited amount of food or energy it has. And it looks like, when it has to choose, it chooses things that are good for us, which is that it protects what we have rather than thinking about getting bigger or stronger. REHMDr. Guarente, do you want to add to that? GUARENTEYes. What I would say, as an interesting perspective on this, is you could say, is there any way that we could get some of the benefit of a low-calorie diet without actually suffering through the pain of, you know, eating every other day, let's say. A friend of mine has told me he eats every third day. And I think that the answer is, yes, I really believe that that's true. And the approach would be to try to figure out, what are the changes that occur in cells in response to calorie restriction and ask, are there any chemical changes? So this is a little bit different from toxins that we were talking about -- but changes in chemicals that aid and abet those metabolic changes that would deliver the benefits. GUARENTEFor example, we're studying a set of proteins that respond to low calories. They're called sirtuins. And they use a small chemical in cells, it's called NAD, that's critical for their action. And we know that NAD is present in foods and precursors of NAD, they're natural products. But they're present in rather limiting amounts. So we're very interested in the possibility that if you could take a dietary supplement that had a relatively high concentration of these, let's say, NAD or a NAD precursor, that you could potentially trigger or trick these response pathways to work under any conditions and get some of the benefits of a low-calorie diet. And I should say that there's an impressive body of data in rodents in the laboratory now that this really works. FINKELYeah. Just to echo what Lenny is saying. I think understanding what the body senses and how it responds to low calories or restriction in food is really important. So we're interested in some of the molecules Dr. Guarente mentioned and some others. So we actually made a mouse recently that has an alteration in one protein that senses how much food there is in the cell and genetically turned down that protein in the mouse. And that mouse lived 20 percent longer than its control. FINKELSo, again, there are 30,000 genes in the mouse, and just changing this one that sort of senses food, produces a mouse that lives considerably longer. REHMAnd, Dr. Mattson, you've looked specifically at brain diseases like Alzheimer's and Parkinson's. What do we know about the benefits of mild stress and how they affect these diseases? MATTSONYeah. Well, what I'm going to tell you is from animal models that are relevant to these diseases. And what is needed then is to extend this work actually to human subjects and patients. And I think most of what we're talking about today has to do with coming up with ways to reduce the risk of developing these disorders, rather than treating them once someone's already symptomatic. MATTSONBut so what we find is, in our animal models of Alzheimer's disease where we have mice that accumulate amyloid in their brain and have dysfunction of the synapses and degeneration of neurons, or in our animal models of Parkinson's disease where the dopamine-producing neurons degenerate, we found that if we maintain them on an intermittent fasting diet, every other day fasting, that was beneficial in slowing down the dysfunction and degeneration of the neurons. MATTSONAnd we find, for example, that one common theme of exercise, fasting, and at least a few of the specific chemicals in fruits and vegetables that we looked at, is they increase production of proteins that are called neurotrophic factors. And it's been known for a long time that these neurotrophic factors are critical for learning and memory and for the survival of neurons. So we think that the -- there's a mild stress imposed on nerve cells by vigorous exercise, fasting and some of these chemicals in fruits and vegetables and that at least one of the adaptive responses we see is increased production of neurotrophic factors, which then protect the neurons and promote optimum brain function. REHMI'm back to the question of asking about fasting and the minimum amount that may be useful. For example, I eat fresh fruit and yogurt for breakfast. And I eat at about 6:00 a.m. I do not eat again until about 7:30 in the evening. I'm just wondering what effect, if any, that may have. MATTSONWell, first, I'll give a plug for your show. If you remember, last year, we had a whole program on intermittent fasting. So the listeners may want to go back in your archive and find that. That'll be easy for them to find. But we find that 10 -- at least 10 to 12 hours of fasting is required to trigger some of the changes in the body and brain that we think are important for the health benefits. And the reason is because it takes -- after you eat a meal -- particularly, you know, a good-sized meal -- that energy goes into your liver. It's stored there. That's always used first. However, if you fast for 10 to 12 hours, that energy is all used up. You switch to burning fat. So fats are mobilized. MATTSONThen they're converted to what are called ketones. And it's very well established in the neuroscience literature that ketones are good for the brain. So if you don't fast for at least 10 to 12 hours -- but it's better to go more, 16 is better -- that will be enough to trigger the production of these ketones, which has a lot of benefits for brain health. REHMThat's fascinating. And you, I gather, Dr. Finkel, have participated in that kind of trial. FINKELNo. I love food too much. I grew up in a house where love and food were intertwined. It's hard for me to break that association. But we're very interested in -- a little bit -- a step, I guess, closer to the cell and the organ. We're very interested in understanding what limiting stress or limiting food does and what are the, sort of, the genetic and biochemical pathways that are activated. And again, we think that if we could understand that, we could begin to develop therapies that might mimic that and have the benefits without the, sort of, the pain or the psychological stress of not having a Thanksgiving dinner. REHMAnd what about you, Dr. Guarente? What do you think about that 12-hour or 16-hour fasting? GUARENTEWell, I think that it's helpful. I mean the -- many years of studies in rodents, of course, show that if you limit the calories about 30 percent compared to how much they would eat if they could eat all they wanted, that you trigger these benefits. Now, that involves an overall lowering of food. But also, when you feed them under those conditions, they tend to eat the food all at once, so there's considerable fasting that's a part of that diet as well. So I think that the health benefits are there. GUARENTEBut as I said earlier, I mean, I think that for us, I think figuring out, as Dr. Finkel just said, what the relevant chemicals are in cells -- including toxins but not limited to toxins -- metabolites like NAD -- if you can figure that code, break that code, then you will have ways of triggering some of the benefits. And what's noteworthy is that these are all natural products, these chemicals. So I think you would have something ready to go, translationally, that people could benefit from. REHMAnd you're listening to "The Diane Rehm Show." We've got lots of callers and lots of questions. So let's open the phones. First, to Lisa in Rochester, N.Y. You're on the air. LISAMany people in the United States especially are overweight. So reducing food intake is beneficial because that prevents obesity and the associated diseases. But I am very skinny and need to eat every few hours and take in a lot of calories just to maintain my weight. So given that the research says calorie restriction makes life healthy and long, am I essentially eating myself to death? And what can someone like me do to increase the chances of health and long life? REHMAnd you're pretty thin yourself. MATTSON...and I think that we just naturally eat less than other people. And so, you know, cutting way back on calories is good for someone who's overweight. We know that. But if you're at a low body weight, you know, there's probably no need to cut back further. REHMBut on the other hand, wouldn't eating lots of fruits and vegetables be helpful for someone like you, who is rather thin, who needs that kind of body cell stressor? MATTSONI think so. And I can't say for sure. One thing that's lacking in pretty much every -- or most things we've talked about today are what are called randomized controlled trials in human subjects. And the case of these chemicals in fruits and vegetables, studies really need -- there's been a lot of studies done in animals. And the results there are very clear. But the history of research is that results that are obtained in animals always don't occur in humans. So we need placebo-controlled trials and human studies. REHMDo you think they'll begin anytime soon? MATTSONWell, there are -- there are some. Even using some of the chemicals, for example, that Dr. Guarente has talked about. REHMAll right. We'll take a short break here. And more of your calls, your email, when we come back. Stay with us. REHMAnd as we talk about a good and healthy, not only diet, but way of eating, incorporating fasting, looking at what fresh fruits and vegetables do for you. We'll go right back to the phones, to Charles, in Fort Lauderdale, Florida. Hi there. CHARLESHello and thank you so much for taking my call. CHARLESFascinating topic and something that's so important, you know, in a country with the number of people that are obese. My question is a two part question. First, is the panel familiar with Dr. Wolford at UCLA in the 1970s that kind of began the studies, I think, on calorie restriction, optimal nutrition, or CRON. REHMYes. I think Dr. Mattson is. CHARLESI'm interested in hearing. I'm sorry. Go ahead. I wanted to, well, it was a two part question. The second part is people following the CRON diet and the laboratory animals they tested it on had a diet that consisted of both plants, vegetables and meat. And I'm curious about the role that, you know, what science says about the role that animal products play in inflammation. And you know, in the process of, you know, how the topic of toxins in the fruit relates to inflammation in animals products, particularly. MATTSONSo, Roy Walford was one of the scientists that developed what was called the biosphere project, where they tried to live without leaving this giant greenhouse for several years. MATTSONAnd actually, they had trouble. And they lost a lot of weight during the time -- they were in there for almost two years and they had to abandon it because they were losing so much weight. But he also did a lot of work on calorie restriction animals. One interesting thing, I should point out, is he ended up developing ALS. Lou Gehrig's Disease later in his life. And among the neurodegenerative disorders we've studied in animal models, the only model where calorie restriction has not been beneficial and may actually make it worse is ALS. MATTSONSo, someone is at risk for ALS because of family history or something, then you know, calorie restriction is unlikely to benefit them. REHMDo you want to comment? FINKELWell, I would just say the history of caloric restriction actually goes back to about the 1600s. There was an Italian nobleman by the name of Luigi Cornaro. And he was lived the noble life the first three decades of his life, was near death, and had sort of deathbed conversion and decided, for the rest of his life, to eat 350 grams of food a day, along with two glasses wine, because he was Italian, so he had to keep his wine. And he kept that diet for the next six decades, died at 102, and along the way, published four books that were sort of medieval best sellers. Sort of the first diet self-help books of the time. FINKELAnd on the benefits of eating less and living longer. GUARENTEYeah, I mean, I think that calorie restriction is gonna be very difficult to apply to humans, partly because, as we've discussed, the variability from person to person in metabolism, in lifestyle and so on. And partly because I think getting it wrong is going to be deleterious. So, my feeling is, something we touched on, I think the critical thing is gonna be to discover everything that calorie restriction does at the cellular level. And be able to pull out of that chemicals, that are natural products, that are changed by calorie restriction. GUARENTEAnd test them in rodents. And this is happening. It's real. And to then do human trials. Placebo controlled, double blinded trials. To see what's going to work and what isn't. And I think if you choose, make good choices in the natural products that you pick in the first place, I think you have a reasonable chance of having success in a clinical trial, if you choose the right end points in the clinical trial. So, you're not going to look at a disease right away, probably, you're gonna look at metabolic benefits. GUARENTEAnd then the question is, you know, who do you recruit for the trial? And you're probably not going to recruit somebody 25 years old in absolutely perfect condition. But sort of somebody average. Maybe somebody middle aged, maybe not in perfect condition, where you have the ability to move the needle in the healthy direction. And I really think this is the way it's going to go and these are gonna hit the marketplace as natural products, dietary supplements that actually work. GUARENTEWhich is going to be something different from what we're used to when we hear the term dietary supplement. REHMAnd I gather, Dr. Guarente, you've got one yourself that you are beginning to market now. GUARENTEThat's right. That's right. We're really interested in the ability to restore NAD levels, because there's data, very good data in laboratory animals, but emerging data in humans that NAD levels decline with aging and we discussed earlier that NAD is incredibly important in triggering some of these metabolic pathways that are important in the response to dietary restriction, calorie restriction. So, yeah, it turns out we believe that there are ways you can build back and restore the NAD deficit in people who have experienced declining NAD. GUARENTEAnd animal studies say that's true, and I think that the critical thing now is to design proper human trials that are controlled properly, that can test these ideas. REHMAll right. To Patrick in East Lansing, Michigan. You're on the air. PATRICKHi. Thanks for taking my call. I had an experience. My father in law had a quintuple bypass at the Cleveland Clinic, and Cal Esselstein, who runs the clinic, required him to do the vegan diet that he had developed as part of a control study in order to have the surgery. So, he went on that vegetable diet, and he had to do one hour of exercise every day. And I watched him lose about 90 pounds and prevent the reversal of heart disease. He was 66 when he had the quintuple bypass. He's 12 years out and I just was so amazed. I took it to heart. PATRICKAnd I did the diet. I lost 90 pounds of my own and I've been a vegan for four years. But it's all based just on the research, and so my question is, how much has T. Collin Campbell's China Study and the reversing heart disease data set that was developed by the Cleveland Clinic with Cal Esselstein's research team, how well has that data stood up in terms of the anti-cancer, anti-stroke properties of the diet? And where can people go to find good research to follow what's being done in other ways? PATRICKI take this program as a great contribution and Joel Fuhrman's Eat to Live book is a great resource I found. I'm gonna go to the Vegetarian Summerfest in Johnstown, PA. I wonder if you'll be there and if you recommend that or other sources. FINKELYeah, well, I won't be there, but I'm familiar with the work, and it's obviously very interesting and exciting. It obviously takes, as Dr. (unintelligible) would say, it takes motivated patients. Our former President, President Clinton, became a vegan after a similar situation. And he obviously seems quite robust. So, I think these things do work. The question is, can we get people to be motivated to do them? And that's really, that's a challenge, you know, obviously, with the epidemic of obesity. FINKELSo, you know, I think there's a lot of good research suggesting that these things work, that you can, in a sense, actually reverse atherosclerotic plaque buildup by making these types of interventions. Which is something most medicines can't do, so I think there clearly is incredible benefits for some of these things, but they're hard for many people to adopt. REHMNumber of callers have asked us to discuss specific fruits and vegetables that are particularly good for people. Dr. Mattson. MATTSONI mentioned earlier that it seems like, at least in the experiments that are done in animals, that the chemicals in fruits and vegetables that are good for health have a bitter taste. And they have kind of a noxious effect with regards to taste buds. So, things like spices, curries that have a chemical called curcumin, which is from tumeric root. One that Dr. Guarente has studied a lot, resveratrol, which is in the skin of red grapes and it's in red wine, too. But it's also in nuts. MATTSONAnd other examples are in broccoli, there's a chemical called sulforaphane. And interestingly, it stimulates cells and activates a pathway that is also activated by exercise involving a transcription factor called NRF2. So those are a few examples. Onions and garlic have a chemical called Allicin. A-L-L-I-C-I-N that causes opening of ion channels in the membranes and nerve cells and that leads to calcium movement into the cell. And the calcium then initiates a series of expression of a series of genes that we and others have found are neuroprotective. So, those are some examples. REHMBut what about ordinary things? Dr. Guarente, like apples and oranges and bananas and pineapple and, you know, things like spices and curries and resveratrol. I mean, certainly grapes, I would think would be equally good, but what about other things? GUARENTEAbsolutely. Absolutely. I mean, many of the things you mention are included in what would be considered a Mediterranean diet. And they're certainly good for you. The thing to keep in mind, though, and I'll use resveratrol as an example, since most people have heard about this. Is the amount that you can get by eating grapes or by drinking wine may or may not be enough to do the trick. And if it's not enough, then it's not going to do any good. GUARENTEWell, again, that's going to require testing, so in the case of resveratrol, in mice, we know how much it takes to work. And the amount present in grapes or wine is not going to be able to do that. You're going to have to purify it and concentrate it and then it's going to work, potentially. So, I think that all these molecules that people mention, curcumin and resveratrol, and apples. You mentioned apples, are solic acid. Have great potential, but there are two ways to deliver them. One is in the actual fruit, and certainly, it's not a bad thing to eat fruit. GUARENTEIt's a good thing. But it might be that one's going to have to purify these compounds and concentrate them and then take them, which was done with resveratrol. People who take resveratrol now take capsules that you buy. And you know, it's caveat emptor out there what you're getting, but if you have a good vendor, then I think you can a supplement that will work. REHMYou know, it does make me wonder whether we're on a road toward pills for food. With all these concentrations that Dr. Guarente is talking about and the concentrations needed and the amounts needed to get what you need. MATTSONI want to point out one thing, that any given fruit or vegetable or plant that we eat has many different chemicals that can activate adaptive stress responses, so in the case of grapes, resveratrol is there, but there are also other chemicals. So, when we eat fruits and vegetables, we're getting many different chemicals, and there's some evidence they may act in a synergistic way to boost cell stress resistance. And if that's true, then taking just one chemical from a plant may not have as great a beneficial effect as actually eating the fruits and vegetables. REHMAnd you're listening to The Diane Rehm Show. And conversely, Dr. Finkel, isn't there some reason to believe that, for example, eating too many nuts, for example, Brazil nuts, or something of that sort, could in fact, harm organs in our body? FINKELAbsolutely. And so, again, the concept that we've been talking about, from the beginning, is we haven't actually given it its name, which is this concept called hormesis. It's a complicated term, but it basically means that things in small doses appear to be good for you which is larger doses appear to be toxic. And that's an interesting concept that's really, has been known in biology for 100 years or so, but is really becoming more and more evident to play a role in some of the conditions that we're talking about, like aging. FINKELWhere things that, as you say, in large doses, have sort of toxicity, but in small doses, appear to activate sort of these defense mechanisms that are beneficial. GUARENTEYeah, I just, we talked about sort of two things that might be confusing to the listeners. On the one hand, it might be better to concentrate some of these things and get them in higher doses. On the other hand, some of them are going to work better in lower doses. And one way to think about that is that the toxins that are going to be effective, you're going to want to get them at a low dose, because a high dose is not going to be good. But natural metabolic compounds in cells, that also are a part of the response to some of these stressers, like low calories and so on and so forth. GUARENTEYou're probably going to have to get it at a higher concentration to be effective. So, I think it's going to be case by case, but in any case, you're gonna have to test these molecules, and that's gonna involve determining what the right dose is. And I think it's gonna be easier to test purified compounds than complex mixtures. So, to really get definitive data, we're gonna have to start off on this path with purified compounds. And then we can build complexity as we go down the road. REHMSo, at the NIH, for example, you would not have folks coming in getting no fruits and veggies and others coming in and getting whole bowls. You would have concentrated materials being given to one group and none to another. FINKELYeah, I think, most, you know, as Mark was saying, I think most of the time, as scientists, we want to break things down and simplify and test them individually, and that way, we can sort of definitively say this compound is good or bad for you. And I think that he raises a valid point that life is complex and fruits and vegetables are complex. They contain many things, which may be, in combination, are more beneficial than the individual components. But I think, you know, as scientists, its incumbent upon us to see, to first test things and understand whether or not them as individual components are good. FINKELAnd then, as Dr. Guarente said, maybe we can sort of reconfigure the ideal fruit or vegetable. MATTSONYeah, I'd just like to say that nobody's going to make any money from fasting, you know, eating fruits and vegetables, getting regular exercise. So, there's a big monetary motivation by pharmaceutical companies and so on to come up with individual chemicals. Whereas we already have the evidence that exercise and not eating too much and eating a lot of fruits and vegetables is good for health. So we should start there. Do that first. Try to get more people to do that first. REHMDr. Mark Mattson, Dr. Toren Finkel, Dr. Leonard Guarente. Thank you all so much. Terrific program. Thanks for listening, all. I'm Diane Rehm.